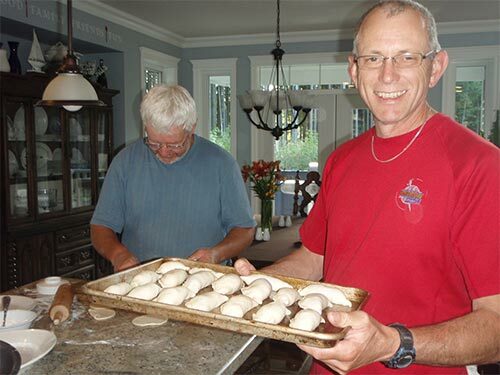 Moose Piroshkies –Russian Piroshkies are as diverse as the people who cook them. 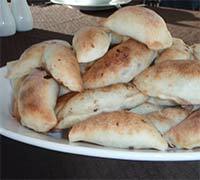 My wife and I were camping a few weeks ago and we were treated to Moose Piroshkies. I asked the friend that brought them if I could get some for our fall Moose hunting trip in a few weeks. She said sure, if we get together as group we can all make them. Not exactly what I had in mind... but it will work for me. 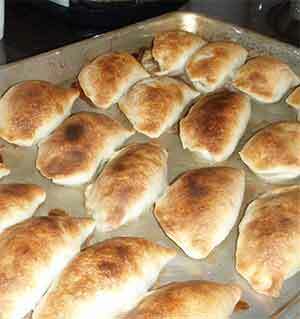 So... a group of friends got together and made Moose Piroshki on a fall afternoon. 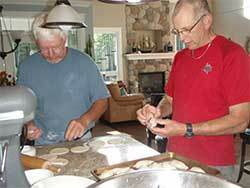 My friend John and I prepare the Piroshkies... while John rolls and cuts the dough I place the meat and seal edges. In mixing bowl add moose meat, onions, salt, pepper and eggs. Mix together well. Set aside. The meat in our mixing bowl, we used teaspoons to scoop the meat out and place on the dough. In mixer bowl put milk, oil, salt, baking powder and flour. Mix on low for a few seconds until a soft dough is formed. 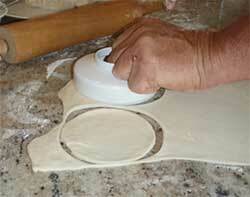 Cut a portion of dough off and roll fairly thin. 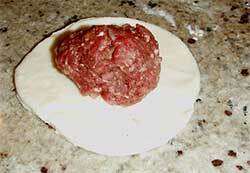 Cut into 4 – 5” rounds and place a heaping teaspoon of moose meat filling into the center. Fold dough over and pinch all around edges. Place on greased cookie sheet and bake in a 425 degree oven for approximately 17 min or until nicely browned. Yield: Approximately 5 - 6 dozen (Really it depends on the size of the dough cutouts and how much meat you put in them. Cutting of the dough. We found a hamburger press was exactly the right diameter. Moose Piroshki before rolling and sealing edges. Dough being prepared for meat and sealing. Do you enjoy eating Moose Meat? Do you have a favourite Moose recipe? Moose meat recipes are something that all moose-meat eaters are looking for, please share your recipes. We are heading out for our annual Moose hunt in a little more than a week from now(the third week in September). The area which we plan to hunt is one we have been successful in before but this year we plan to do it with archery equipment only. Our chosen season is during the Moose mating season (the Rut), therefore it promises to be exciting as it is during this period that Moose can be called in to close distances. For at least one meal during this hunt we will be enjoying Moose Piroshkies... It is very fitting to eat Moose while hunting them. Don’t you think?